We have the best prices of the season right now on all Kids' items, and with promo code GROMMET, you can save an additional 20% off sale prices. Our ZnO SUNTECT line is moving fast, so visit Coolibar.com now! Skin cancer is too common. Great Grommet! Do the garments combat the harmful effects of UV and UVB rays? The Ultraviolet Protection Factor (or “UPF”) rating system measures the UV protection provided by fabric. UPF is like SPF except UPF rates protection against both UVA and UVB. 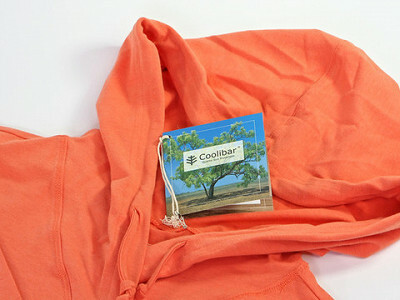 All Coolibar brand garments rate UPF 50+, which is the highest possible rating. 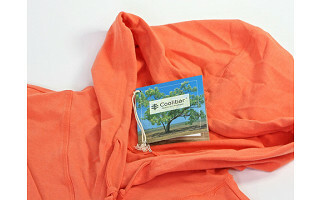 We also guarantee the sun protection for the life of the garment. We're looking for a shirt to be worn by our son's entire Boy Scout troop. Is it possible to print a Scout logo on these products? Yes, many organizations including schools take our items and embellish them with their own logo. In fact, if you are interested, we offer kids' sun hats at 50% off to qualifying organizations (including Boy Scouts) under our Coolibar School Hat Program. I'm curious about that orange shirt in the video and the photo ... can you explain how there's bamboo in there and how the zinc works? Do you have to wash it or care for it differently? The shirt is our Pullover Hoodie, and no special washing or care is necessary. Bamboo yields a natural plant fiber which is blended with cotton. ZnO SUNTECT® embeds millions of tiny particles of zinc oxide -- the same ingredient that is used to block UVA & UVB in better sunscreens -- into every fiber. 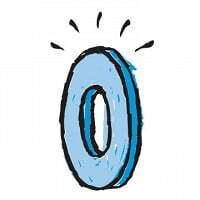 These ZnO particles cannot wash or wear out and will provide healthful benefits for the life of the garment. I like Joanne's hat, especially with the neck cord for the wind. Can you tell me what the order number is? Thanks! I had no idea that t-shirts only provided 5-10 SPF protection. Geez! I just made a purchase of 4 shirts, one for every member of my family. We boat, hike and go to the beach. I will feel better now knowing we are a lot safer from the sun. Thanks for highlighting another great product Daily Grommet! Our ever popular Sedona Hat 02216, and don't forget the matching tote and save $14.95 on the set. I purchased sun protective fabric...um...two years ago. It's not helping me sitting in my sewing stash! It just may be time to make the purchase and get protected! Thank you DG! A normal t-shirt has even less protection in the water. ZnO SUNTECT® maintians UPF 50+ protection even when wet. I know that most hats these days are one-size-fits-all, but I often have trouble finding hats that fit squarely on my head, without having to tilt the hat upward. (My head is 23" in circumference.) Do any of your women's hats fit a larger-than-average head. I forgot to add--my sons (ages 5 and 7) have been wearing Coolibar All-Sport Hats for two years now, any they are wonderful! My youngest is a redhead, and his skin has been saved by this terrific hat. Have you consider clothing for hikers? Lightweight pants with zip off bottoms, short and long sleeve ligher weight tops, jackets with and without hoods (detachable/breathable would be great). Big market! @Traci Bisson...I appreciate your thanking us for the find. We have been a Coolibar family for 5 years now. The twins (age 2), the 4.5 year old, mom and yours truly are all decked out when we go to the beach or outside (love those hats). People must wonder why we all have the same logo on our clothes. On the hat question, just a reminder that we have sun protection experts available in our Customer Service department 1-800-926-6509. They can answer questions about sizing, etc. For larger Women's hats, we have several that come in L/XL including 02509w Reversible Bucket Hat and 02521 Chlorine Resistant Bucket Hat. @Joe Lima. LOL on the identical twins logo family. When I lived in Ireland and would come back and visit the US I would always remark how adults dressed just like their kids (not so much the case in Dublin)...like seeing polo shirts and khaki shorts on the whole family in Freeport, Maine, walking across the street from LL Bean eating ice cream cones. You brought back that memory. Any chance you folks are going to come out with a line of men's suits? I wear one everyday and would love something that was a little more comfortable in the hear. I ordered one of these hats for a present and loved it! I want to order another but don't see the hat except for the video. Are they gone?? @Kathy Thanks for coming back and sharing! Clicking the 'Buy it Now' button on our site will take you to the Coolibar website where they have a large variety of hats. Like many catalogs, their selection will change from year to year and season to season but they will always have a good assortment of products to protect you from the sun! These days, most of us seem to have the sunscreen routine down, but did you know the latest trend in protecting yourself from harmful rays is all about layering? When a national skin cancer crisis hit Australia, people like John Barrows fought back. And luckily for us, John brought his sun-savvy ways here to the U.S. with his company Coolibar. Coolibar makes clothes for the whole family with a UPF of 50+ (UPF is just like SPF in sunscreen, only it measures the protective power of fabric). They even figured out a way to get zinc oxide in the fabric! Apply the sunscreen, layer on a cover up, swim top, or hat from Coolibar, and you’re ready to go.